L.D.B. Co. Prince Regent Bavaria Pottery Mark Query:- A Family Heirloom:- My mother has a covered bowl that belonged to my fathers' great grand-mother. 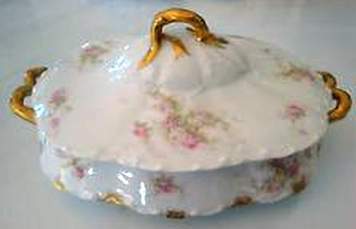 It is a rose motif w/ gold leaf on the handles of the bowl and on the handle of the cover.It also has gold leaf along the edges of both the cover and the bowl. On the bottom of the bowl are 2 stamps,one is simply spelled BAVARIA. The other is a circle shape with an elegant crown above it and the #26 below it. To best describe the circle would be to start with the center,it is a circle divided in to 4 quadrants starting in the upper left corner and following clockwise the lettering goes " L "," D "," B ",and " Co". another circle goes around that and the words Prince Regent China along the topmost part of the circle and Germany along the bottom. I could forward a couple of pictures if it would intrest you. My mother has become quite curious about it and I just cannot find other marks like it. Any help would be great. Nice heirloom to have in the family. The bowl has a colourful history. Your pottery mark dates from 1910 onwards and is one of the marks of a company called the Moschendorf Porcelain Company ('Porzellanfabrik Moschendorf A.G.) from Bavaria, Germany. They used the 'L.D.B.Co. Prince Regent' pottery mark as a special export mark for wares made for the Flambeau China Co, a French company based in Limoges. Founded originally in 1879 as the Kühnert & Tischler Porcelain Factory (Porzellanfabrik) they changed their name to Moschendorf in 1895. After 1937 they became the Porzellanfabrik Otto Reinecke which finally closed in 1957. I have a family heirloom beer stein (stoneware?) w/pewter lid. the only mark is on the inside of the lid: crown over circular stamp with the letters LDB and number/date 1769. The glaze on the stein is white with a horse outline and various trees, bushes, fences in pastels of purple, blue, green, gold. There is no legible mark on the bottom of the stein, though it appears a several marks may have been scratched off through the glazing on the bottom. Can you provide any information as to origin? I would like to determine the value of this.